Living... back in her hometown of the Bronx after some time away in Minneapolis. Rhoda was only supposed to visit her sister Brenda for two weeks, but she met a guy and never flew back west. Profession... window dresser and costume designer. Rhoda has an eye for fashion, as evidenced by her trendy headscarves. She shares her gift with the world by decorating department store windows, a career she began in Minneapolis before graduating to the big leagues in the Big Apple. Relationship Status... married to Joe Gerard, a divorcé with a construction business whom she met while visiting her sister. A whirlwind romance leads to a quick engagement and wedding, complete with Rhoda taking the subway and running down city streets in her wedding dress. Challenge... making her marriage work. After years of playing second fiddle to her friend Mary Richards back in Minnesota, Rhoda jumped at the chance to explore a serious relationship with Joe. But once the honeymoon period is behind them, things begin to fizzle. Are marriage counseling sessions and serious conversations about their future enough to keep this relationship going? Personality... loud, brash, and outgoing. If Rhoda has an opinion, you’re going to hear it – it’s a necessary trait to survive in 1970s New York. She can be insecure about her body but treats it with the same sarcastic outlook she brings to the rest of the world. Rhoda’s always entertaining to have around. Rhoda Morgenstern's popularity ranking on CharacTour is #3413 out of 5,000+ characters. See our top-ranked characters and read their profiles. 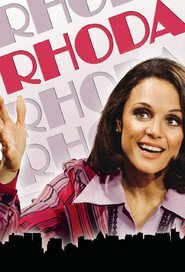 Rhoda is an American television sitcom, starring Valerie Harper, which aired 109 episodes over five seasons, from 1974 to 1978. The show was a spin-off of The Mary Tyler Moore Show, in which Harper between the years 1970 and 1974 had played the role of Rhoda Morgenstern, a spunky, weight-conscious, flamboyantly fashioned Jewish neighbor and native New Yorker in the role of Mary Richards' best friend. After four seasons, Rhoda left Minneapolis and returned to her original hometown of New York City. The series is noted for breaking two television records, and was the winner of two Golden Globes and two Emmy Awards. Rhoda was filmed Friday evenings in front of a live studio audience at CBS Studio Center, Stage 14 in Studio City, Los Angeles, California.